This 2001 Chevrolet Corvette convertible is a beautiful addition for a collection, or to drive in style on a regular basis. 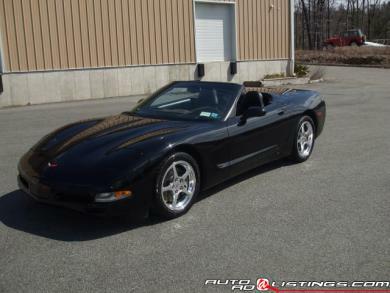 The vehicle was always garaged and has very low mileage for this type of year Corvette. I had purchased this vehicle, from a Ford/Lincoln dealer and after seeing it just hitting 4,000 miles on it, I had to buy it at that time. My son who is an ASE certified technician, has always maintained it personally, and has documented all repairs & services done by him, which were not many due to low driving time. I have all the factory manuals that I had purchased from Helm, the manufacturer who makes all the manuals for General Motors. The body of this vehicle has no blemishes and is well taken care of, and the underneath is very clean. I always kept this car cleaned and detailed at all times in order to make sure that I did not let it go. This was very important to me. The interior was always very well taken care of, and the leather seats were always cleaned and other leather parts cleaned and moisturized, to prevent cracking. I had the wheels taken off once a month to have them cleaned and polished in order to keep them in very good looking order the way a Corvette should be. The tires are in good order and are the original tires that came with vehicle. In October of 2008, I was on my way to a restaurant, one evening and was held up in traffic when the unbelievable happed. While waiting in traffic a gentleman came up to my window and said for me to turn around, due to road closing. While trying to back up the occupant in front of me decided to not look behind her, and backed into me. Damage was done to the Corvette, due to having the headlights on. I had brought it to a known body shop, where I knew the owner who has excellent experience repairing Chevrolet Corvettes. I have all the documents related to the accident and what was done and repaired. Now the vehicle looks band new like nothing even happened. You know the good old rumor, they say when a corvette has an accident. �The body it never looks the same�. You�ll never even see the body work, or minor blemishes. Thank you for your interest. If you have any other questions please feel free to email me or call me.